Is There Any Free Converter to Help Me Convert Videos to MP4? Yes. 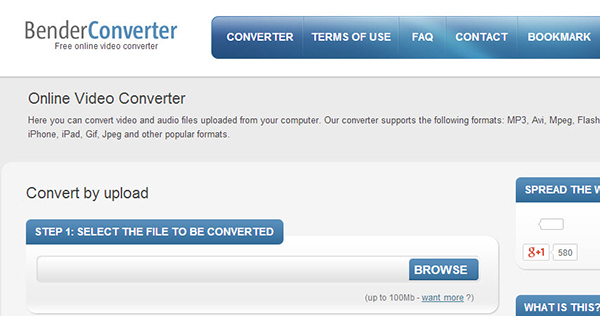 There are a number of free converters that can convert your videos into MP4 formats. These days, converting videos from one format to another is no big deal. This is because there are a dozen of online and third-party programs that allow you to convert videos between various formats for free. Of course, for more sophisticated features, you may need to go on searching for specific programs that can be quite costly. However, for simple video conversions such as converting videos into MP4 formats from formats such as AVI, you can easily find free online tools that require no other program for converting. Free Online Video Converter has been there for quite a while serving the community with satisfactory results. It is an easy-to-use free online video converter that lets you convert videos into a number of formats, including MP4. It has a number of powerful features as well. The conversion speed is high. The files are automatically downloaded to your desktop once converted. There is a limit of 100 MB of video file size that can be converted at a time, which is sometimes quite frustrating. Zamzar is another well-known video converter that is easy to use and to operate. You can simply convert a file by importing the desired video into the program, choosing the output format and then converting the file. The program sends the converted file link to your email. The program is very easy to us. You might experience lower quality of videos after they have been converted. 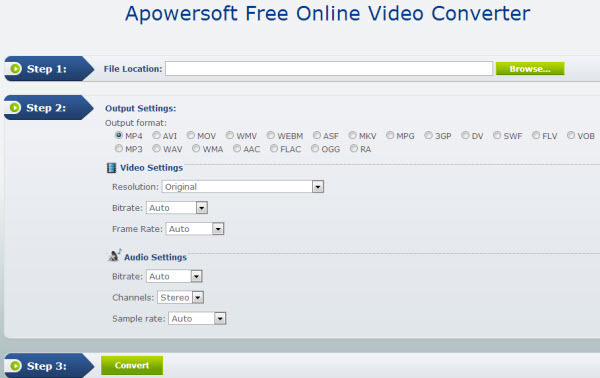 Apowersoft Free Online Video Converter is a very powerful video converter as suggested by its name. This is because it can convert videos of large sizes which are not an option in many other free online video converters. Moreover, it is very easy to use and as with other tools, you just need to import the video, select an output format and then start the conversion. The greatest advantage with this tool is that it can convert large-size videos easily. Although it can convert large size videos, it does take time to do so. This implies that the conversion speed may be compromised. 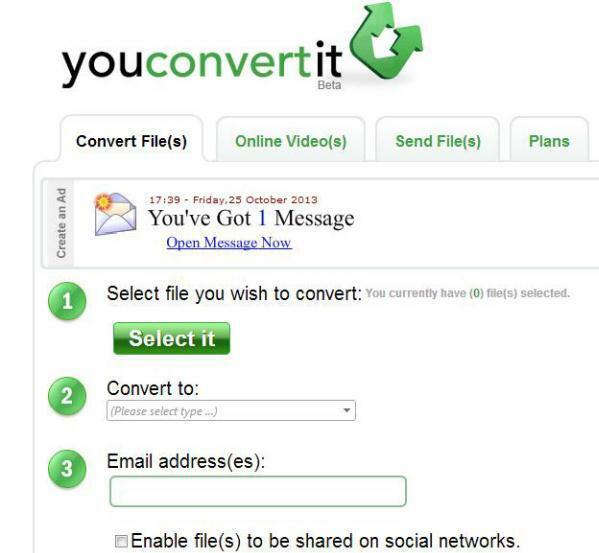 Youconvertit is another useful free online video conversion tool that lets you convert videos easily and quickly. However, you will have to change the names of the videos so that can be played in new formats. There is a limit to the file size that can be converted and that limit is up to 300 MB. 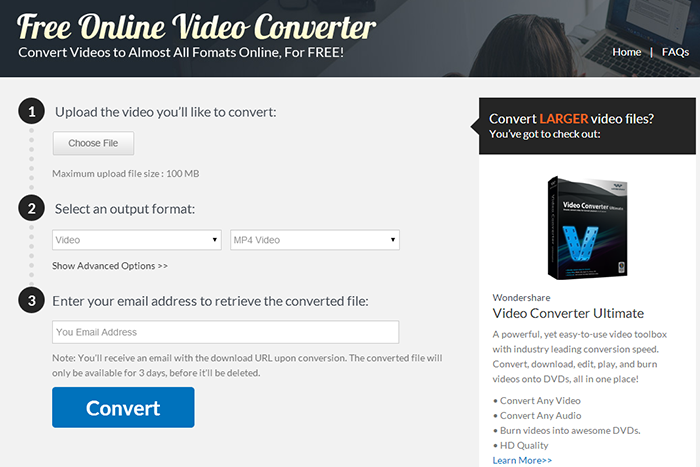 Bender Converter is another amazing tool that lets you convert videos easily. It has got a number of useful features that can be very beneficial. The user-friendly interface helps users with no experience in file converting to finish the task easily. A variety of formats are supported. Users can convert their files easily and quickly. The program allows you to select a device manually that the video supports and thus helps the users who have little knowledge. There is a limit of 100 MB file size that can be converted. 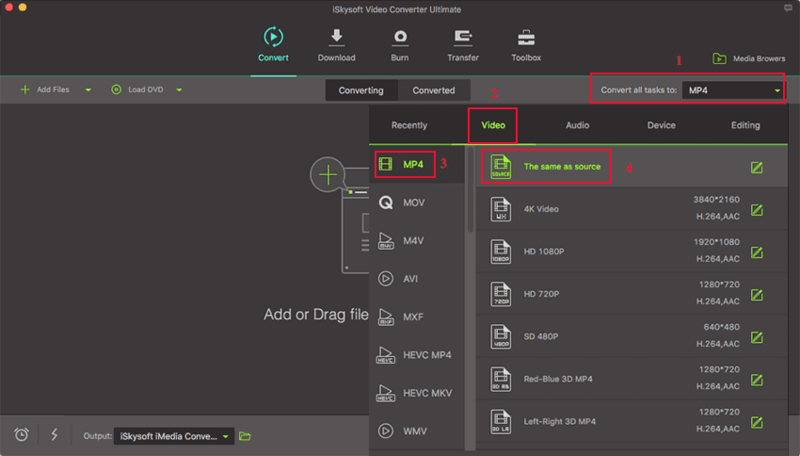 Apart from the above mentioned video converters, you may also want to try iSkysoft Video Converter Ultimate. It has got a number of amazing features and lets you convert videos easily into almost any format you can think of. Also, you can convert online videos and convert videos into formats that can be easily edited by various other video editing software products. iSkysoft Video Converter for Mac meets the need of both beginners and experienced users. It converts your video files at a tremendous speed. Its user-friendly interface makes the converting process enjoyable. You will be impressed by its powerful and advanced functions. There are more useful features for you to explore. The first step is to import the video file you wish to convert into the program. You can simply drag and drop the video into the program or go to "File" and then choose "Load Media Files" to import your files. After you have finished importing your video file into the converter, you need to select an output format for your file. You are allowed to select a variety of output formats displayed on the tray at the bottom. Here, MP4 format is the right choice for you. Click "Convert" and you are all done.